With the updated AppleInsider iOS app, iPhone 6 and 6 Plus owners can get the day's freshest Apple news delivered in screen resolutions native to their handset, while Apple Watch owners will be granted quick access to headlines when the device launches next week. The official AppleInsider app now displays in the native resolution of iPhone 6 and iPhone 6 Plus. Today's free update comes after AppleInsider received numerous requests to add native resolution support for Apple's newest big-screen iPhone models. The new support means readers won't see a scaled-up version of the AppleInsider app. Zoomed-in apps are usually spotted by enlarged top bar content. For example, in the previous build, the cellular signal meter, clock, battery life indicator and other iconography at the top of an iPhone 6's display would show up a bit larger than viewing those same assets from the home screen. That's gone with our new app version. 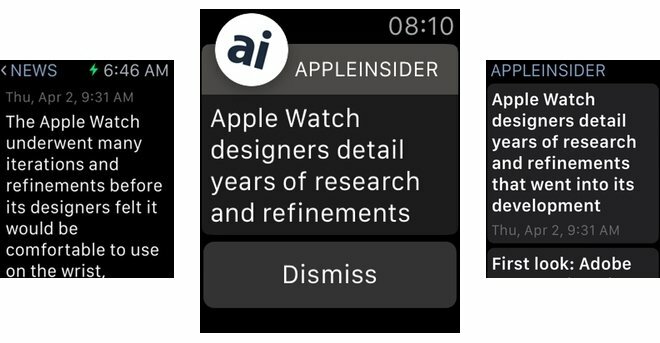 Next week, early Apple Watch adopters will also be able to access bite-sized chunks of the biggest Apple news and rumors, as AppleInsider's app will offer full Apple Watch support from day one. Created by our good friends at digital design firm Crafted, AppleInsider for Apple Watch comes with a streamlined interface that offers at-a-glance access to the stories you care about most. AppleInsider's official app includes support for the Apple Watch. AppleInsider also comes with support for Handoff. When browsing the latest stories on the Apple Watch, users can quickly switch to their iPhone for a more comfortable sustained reading experience. Handoff also works between iPhone and iPad. The new version also brings 64-bit support to take advantage of Apple's latest A-series SoCs, translating to more efficient code execution. Version 2.1 includes the same great features introduced in previous app iterations, like control over article font size and weight, a much requested addition. Other past improvements include push notifications, home page article timestamps and snappier image loading times. 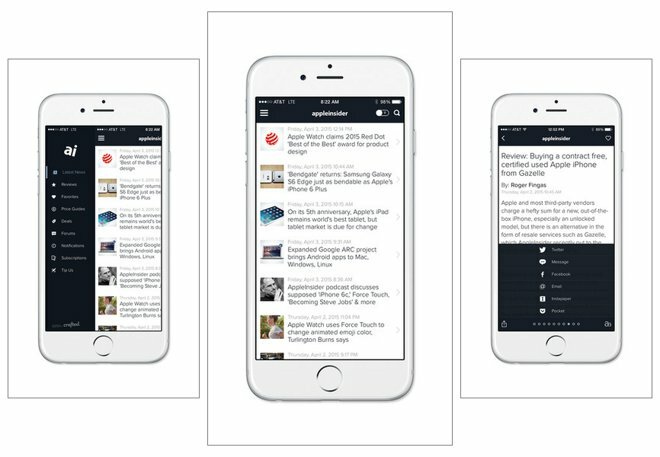 Readers can subscribe to AppleInsider Plus for an ad-free experience and the ability to save your favorite articles to Instapaper and Pocket. As always, non-subscribers can continue to enjoy complete AppleInsider news coverage, intriguing features and poignant opinion pieces completely free within the app. Of course, the same content is available through our traditional websites, accessible from your favorite desktop and mobile Web browsers. Readers can also follow us on Twitter, Facebook, Google+, through our Newsletter and via RSS. AppleInsider version 2.1 is a free 21-megabyte download from the iOS App Store.